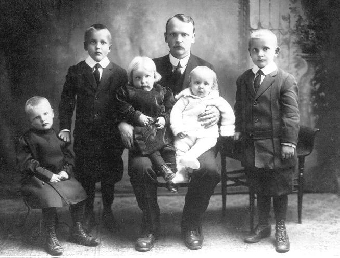 Neil, Karl, Norman, Eric and Henry with their father, Kalle. The five boys were all born in Toronto but we understand that they were taken back to Finland on one occasion. We believe the trip was made because Edla's health was a matter of some concern. 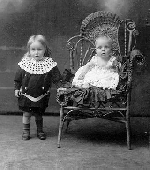 Edla died at an early age leaving Kalle with the sole care of five boys. 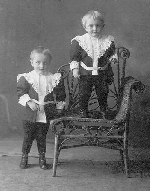 The three oldest boys were temporarily placed in an orphanage in Toronto, and the two babies were placed in two different homes of family friends; people of Finnish background. These arrangements were necessary because of the nature of Kalle's work as a tailor. He was not allowed to see the boys in the orphanage but would come and visit them, speaking through the fence when they were playing outside. Henry told that every Sunday they were taken to one of four downtown churches and were seated together as the "orphan kids."